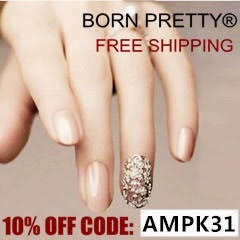 This time it's my turn to try some Indie Polish polish :) If you haven't yet, check out Annie's swatches here! Tanya from Indie Polish is a Canadian indie nail polish creator... So yay, I really do like supporting local / Canadian talent. She was really sweet and sent me 4 polishes for review. One that is easily going to be one of my go-to polishes ^_^. All swatches have 1 layer of Pro FX Fiberized Ridge filler as base coat. My poor nails are still messed up from camping.. Who knows when they will be good again?!?! But Pro FX does wonders to smooth out my nails :) Also my cuticles need more TLC - someone halp! Enterprising Idea Capt: This is a faded medium blue with a golden shimmer and a slight holographic effect. At first I thought it was a topper but it was actually very opaque. The subtle holographic effect plays well with the golden shimmer laced into the base colour. Due to the golden shimmer, the blue is faded but when I removed it the blue is actually darker. Okay that was just a random note hahah.. I liked it on me more than I thought I would :). Application was very smooth and perfect in 2 coats. ONE coat - almost opaque enough! Golden shimmer comes out at different angles / lighting! Odd Duck: It has tiny 'fibres' which others have named feather effects etc. It is blue, pink, purple and golden yellow bar glitter in a clear suspension base. The bars are quite fine and tiny so there wasn't much fishing needed. It was sparse but after 1-2 strokes on the nail there was evenly distributed coverage. I like this better than the overwhelming chunks of bar glitter other brands do. I wore it over Ahoy Sailor. Winter White: Pretty much the perfect name for it. When I tried it on, my friend said it reminded him of snowflakes! It's a shimmery silvery white with pink and blue shimmers. It is *almost* opaque in 2 coats which is fine since it's so shimmery it hides the VNL. 3 coats is a bit too thick. I think it'll be a nice topcoat for a base colour as well. It dries to the touch quickly (under 2 minutes) + another 1-2 minutes and it was dry! I find most indies dry a lot faster than some mainstream polishes.. anywho..
ALL my sunlight pictures were blurry so the following is with flash only. Price: A mini is slightly under $5 and full sized are slightly under $10. Love this brand! Tanya is such a sweetie!